When I decided it was time to learn how to script comics, I began searching for books to use for self-directed learning. This July, Brian Michael Bendis’ Words for Pictures: The Art and Busiiness of Writing Comics and Graphic Novels was published, giving aspiring comic book writers the big picture on how to bring their words to life in two-dimensional worlds. It is a beautiful softcover book printed in 210 full-colour pages, filled with observations and advice and bursting with some of the most beautiful artwork the comic book industry has to offer. Bendis is a man of many talents, both as an illustrator and a writer. He has written and drawn a number of his own comic books and has written for Caliber Comics, Image Comics, Oni Comics and now Marvel Comics. He has won five Eisner Awards, including “Best Writer of the Year” in 2002 and 2003. At Marvel, he is one of the primary architects of the Ultimate universe of comics and has worked on a handful of other traditional titles as well. In Words for Pictures, Bendis starts with the question of why the reader is interested in writing comics, examines scripting styles and how it’s done, talks about working with artists and editors, looks at the editing process, answers FAQs and interviews his wife, Alisa Bendis, on the business aspect of writing comics. The seventh chapter has a series of simple but effective exercises for the aspiring writer to “get his/her toes wet.” The concluding chapter addresses the fear that often prevents a would-be writer from writing. Bendis comes off as extremely likeable; admirable, even. He is a role model for what a writer should be to his artist, stressing the importance of relationships with collaborators. He explains, “I don’t ask the artist to draw my world; I write into theirs. I literally close my eyes and imagine the world according to them. I see the faces that they draw, the buildings the way they draw them. I try to imagine the perfect comic book art from this particular artist and I write toward that vision. I try to put all of my ego aside and do everything I can to let the artists shine as brightly as they can.” Bendis not only wins me over with this passage, but makes me wish I was an artist who could collaborate with him, in spite of the fact I can’t draw my way out of a paper bag. Bendis doesn’t just tell you what he thinks, he interviews some of the leading writers, artists and editors in the comics industry today, reporting on what they think, and what they value in a writer. That said, Words for Pictures, isn’t a one-stop-shop to teach you everything there is to know. When I received my copy, I had just read Peter David’s Writing for Comics & Graphic Novels, which I purchased second hand, as it’s no longer in print. David’s book shares common ground with Word for Pictures, but he walks you through the steps of story building and has exercises at every stage to teach you the skills and reinforce the lesson of each chapter. Bendis’ book assumes you know or possess many of these skills already, and are taking the next step to break into the world of comics. If you are an aspiring comic-book writer, you need this book in your collection. Bendis’ Words for Pictures is to comics what Stephen King’s On Writing is to novels and short stories. An enthusiastic writer with a passion for comics and supernatural horror, Stephen grew up in Almonte, ON, lived in Nunavut, and now divides his time between Maitland, NS and Ottawa, ON. A dedicated environmental activist, his meticulous attention to detail is surpassed only by his robust laughter and generous spirit. This week, I wrapped up production on the first page of Canadian Shield, taking my comic from physical desktop to electronic desktop. First I scanned the artwork that I created for the last blog. Colouring the panels in Photoshop followed, and I did the lettering in Illustrator to complete the project. Historically, colourists and letterers have been the unsung heroes of the comic book industry, but that’s changing, with recognition of how vital the roles are. For some great discussion on colouring and lettering, listen to the Nerdist Writer’s Panel, Comic Book Edition Podcast #63 for a Q&A segment on both. There’s a science to this art. Who knew? I can name at least one person who didn’t. I discovered that when you’re drawing and inking, you need to close all your shapes, even when breaking borders, as I did with the fracking rig tower in my final panel. A number of times I applied a colour and suddenly the whole page would change. Getting around this problem wasn’t easy, and it happened many times, in many places. Also, my colour selections may lack the desirable addition of emotional punch that Redmond suggests. At the next stage, I was comfortably back in the realm of words and letters. I added voice balloons and laid my text over them. My lettering lacks the flair that the pros exercise, but it’s not bad for a first attempt. Looking back at this project, it turns out, putting words in the mouths of villains and heroes is what I’m most comfortable with, and I think I’ll leave the art to the artists. Come back for my last instalment of Full Script for my review of Brian Michael Bendis’ Words For Pictures: The Art and Business of Writing Comics and Graphic Novels. One of my favourite comic books, about a Canadian superhero team, is Marvel’s Alpha Flight. I dream of being part of an all-Canadian creative team that would work on it, with Nick Bradshaw – an artist from Moncton, NB – working as the penciller. Among his accolades, Nick pencils for Marvel’s Wolverine and the X-Men and Guardians of the Galaxy. I’ve had the pleasure of talking with Nick at Ottawa Comiccon, and Summer Fear in Tatamagouche, NS. He’s a graduate of the Algonquin College Animation Program. I’ve watched him draw, and I love his style. At the outset, I decided that if I was going to take this Canadian Shield comic project seriously, I had to get some solid advice. I turned to a second-year Graphics Design student at Algonquin College, Matt Kemball, co-founder of the Algonquin Comic Book Club (2013-14). Matt is also a co-founder of Alchemic Archetypes, an Ottawa-based independent comics studio. He gave me useful tips which I will be putting to good use throughout the project. First, I revised my script. I realized I could benefit from having more information on what should appear in each panel. Then I started drawing thumbnail-size images of my page based on my notes. I wondered if a different panel configuration would look better on the page and still allow me to include the images I wanted. I drew three page layouts. I settled on the second, which I then redrew larger to get a better idea of what it might look like. 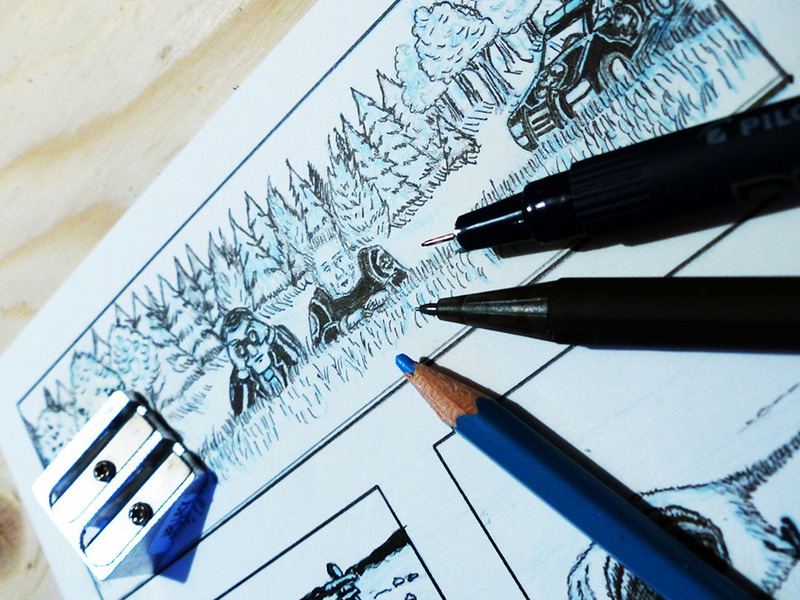 The next step was to draw the artwork on full-size comic board using a “non-photo blue” – or “non-repro blue” – pencil. The reason you want one of these magic pencils is that when you scan or photocopy images drawn in this colour, the lines don’t show up. This gives you a means of doing rough work over which you can draw select, final lines in regular black lead pencil, and only have the final work show. The last stage for this week involved inking the illustrations, using a set of my wife’s Pilot Drawing Pens. They were so nice to use, and the results were great. Who are your artistic heroes – pencillers and inkers of the comic-book world – whom you’d like to work with, if you could? I feel a little like the Batman villain, Two-Face. Half of his face is that of a handsome former district attorney, Harvey Dent, and the other side is scarred with burned tissue. Two-Face uses the flip of a coin to determine the fate of his victims. I contemplate flipping a coin to choose a course of action. A comic book script is a letter, written primarily to your artist (penciler), to inform him or her about the story, and your vision for panel layouts, while giving the artist sufficient creative space to do what they do best. It is also read by the editor, the colourist, and the letterer. Of course, in the production of my comic book, there's only me. So, I ask myself, do I really need to write a script? 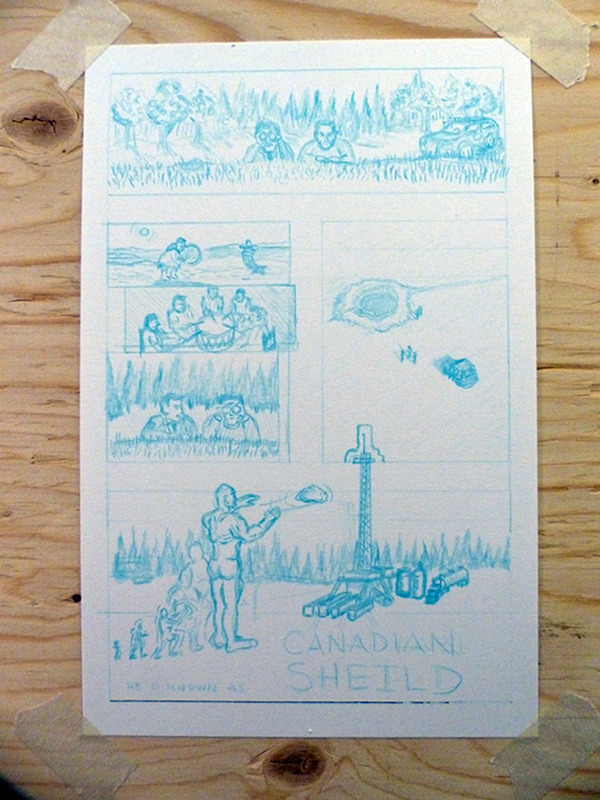 This is my first draft version, in full script style, of the script for the first page of Canadian Shield. begins and ends. “There is no wrong way to do it,” says legendary comic book writer/editor, Len Wein. In Episode 47 of the Nerdist Writer’s Panel – Comic Book Edition, Wein mentions that some writers submit scripts in the form of stick-figure drawings with word balloons. Most comic-book scripts are written using Microsoft Word. So, full script it is; no coin-flip required. Two-Face would be disappointed. This format will help me envision what each panel should contain, and the words that should appear in them. I did some research, to make sure I wasn’t stealing a character concept someone else has created, and it looks like I’m in the clear. 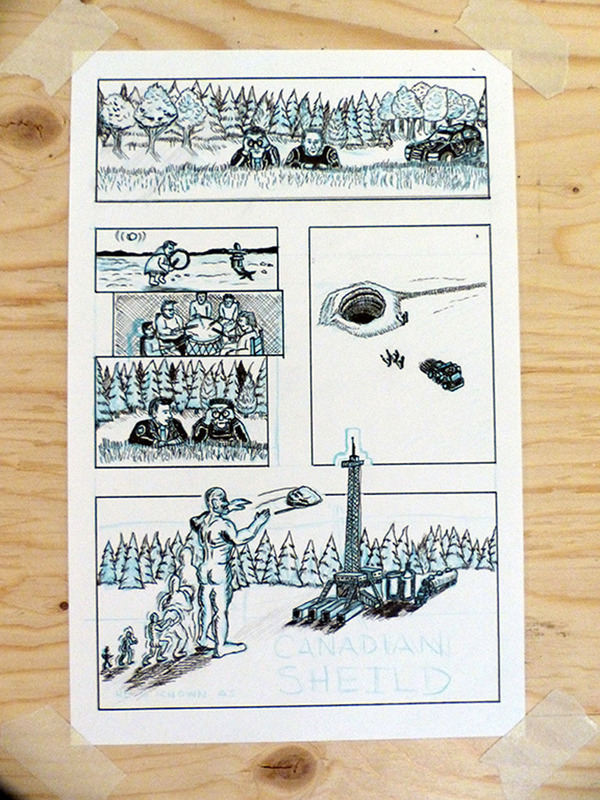 My comic is going to be about a Canadian superhero – Canadian Shield – a character made of rock, and named after the oldest rock formation in Canada. What kind of comic would you write, given the time and skill? I didn’t know it then, but I grew up in the golden age of comic books. My high-school friend Chris introduced me to Chris Claremont’s writing in Marvel’s Uncanny X-men and John Byrne’s art and writing in Alpha Flight – a Canadian superhero team. From the DC Universe he showed me Crisis on Infinite Earths, my first major summer cross-over event, and Alan Moore’s Swamp Thing. I was hooked, and collected comics for about a decade. Being a dreamer, I contemplated how cool it would be to write comics but dismissed the idea because I didn’t have the skills. When I went to college, I couldn’t afford to buy comics. Then I moved to Iqaluit, Nunavut where I couldn’t acquire comics. Collecting comics went to the wayside and I eventually forgot that I’d even thought about writing comic books. That desire was re-awakened last year while listening to a podcast interview of author Neil Gaiman. He recounted a list of things he knew, as a child, that he wanted to write. Neil mentioned comics and it all came back to me. Inspired, I began research. My primary source became The Nerdist Comics Panel podcast, which I listen to religiously. Eventually, I wrote to their Facebook page, asking about sources for self-directed learning. In Episode #47, Ben Blacker, Adam Beechen, Heath Corson and Len Wein devote a large portion of the podcast to that discussion. I was so excited that my question was taken seriously, that I began to feel my dream was crystalizing. 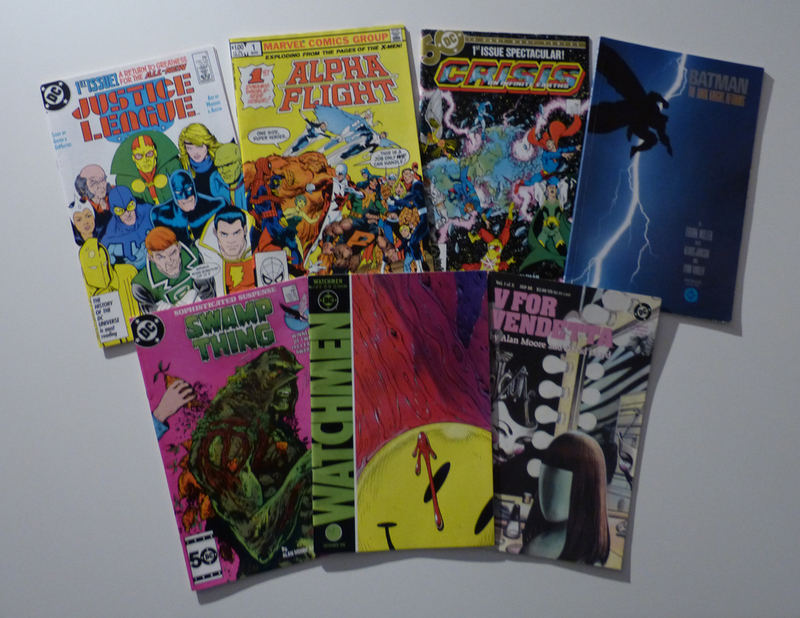 I also wrote to author Jonathan Maberry – whose comic-book writing credits include Marvel Universe vs Punisher, Captain America: Hail Hydra (Marvel), Bad Blood (Dark Horse), V Wars (IDW) and Rot & Ruin (IDW) – to find out what source he would recommend. Jonathan keeps a copy of Peter David’s Writing for Comics & Graphic Novels in his library. By the time I finished reading that, I learned Brian Michael Bendis’ Words for Pictures: The Art and Business of Writing Comics and Graphic Novels was being published in July. Both books have turned out to be excellent resources. Interested in scripting comic books? What are your preferred sources for information? In my next few posts, I’ll share my process of scripting and preparing artwork for the first page of my first comic book. I hope you’ll join me for the adventure! An enthusiastic writer with a passion for comics and supernatural horror, Stephen grew up in Almonte, Ontario, lived in Nunavut, and now divides his time between Maitland, Nova Scotia and Ottawa. A dedicated environmental activist, his meticulous attention to detail is surpassed only by his robust laughter and generous spirit.